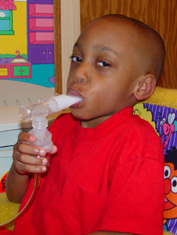 A nebulizer is a compressed air machine that turns liquid asthma medicine into a fine mist you can easily breathe. Nebulizers are good for young children, people who have trouble using metered dose inhalers, and people who have severe asthma. Nebulizers come in many forms. Your nebulizer may not look like the one pictured here, but they all work in about the same way. Read the instructions that came with your nebulizer since there are many types of nebulizers available. Measure the correct amount of normal saline solution using a clean eyedropper. Put it into the plastic attachment cup. If your medicine is premixed, do not add normal saline. Add it to the cup, then go to step 3. Measure the correct amount of medicine using a clean eyedropper. Put it into the cup with the saline solution. Fasten the mouthpiece to the T-shaped part of the nebulizer. Then fasten this unit to the cup, or fasten the mask to the cup. For a child over the age of two, use a mouthpiece unit because it will give more medicine than a mask. Put the mouthpiece in your mouth and seal your lips tightly around it, or place the mask on your face. Make sure the air tubing has been connected to the machine and the nebulizer. Turn on the machine. Take slow, deep breaths in through your mouth. Hold each breath 1-2 seconds before breathing out. Continue until there is no more medicine in the cup (about 10 minutes). Store the medicine as directed after each use. Clean the nebulizer after each use. Regularly cleaning the nebulizer is important because a dirty nebulizer may cause an infection. A good cleaning routine also keeps the nebulizer from clogging up and helps it last longer. Remove the mask or mouthpiece and T-shaped part from the cup. Rinse the mask or mouthpiece and T-shaped part in warm running water for 30 seconds. Rinse the eyedropper in warm running water for 30 seconds. If possible, use distilled or sterile water for rinsing. The tubing should not be washed or rinsed. After rinsing, shake off excess water. Air-dry pieces on a clean cloth or paper towel. Put the mask or mouthpiece and T-shaped part, cup, and tubing back together and connect the device to the machine. Run the machine for 10-20 seconds to dry the inside of the nebulizer. Disconnect the tubing from the machine. Store the parts in a zip-lock bag. Follow steps 1 through 5 above using mild dishwashing soap to clean the parts. Be sure to dry all parts completely. After washing with mild dishwashing soap, soak the parts in a solution made of one part distilled white vinegar and two parts distilled water for 30 minutes. Throw out the vinegar water solution after use. Do not reuse it. Never put the compressed air machine in water. Clean the surface of the machine with a damp cloth as needed. View a pdf, printer-friendly version of this page.